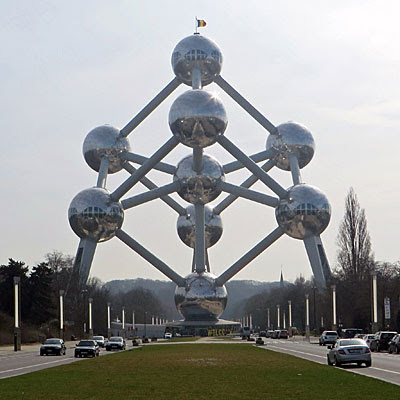 When the Worlds Fair came to Brussels in 1958, the organisers sought to build a landmark building to wow the crowds. They nearly plumped for a massive mast, what with telecommunications being big at the time, but instead an engineer called André Waterkeyn persuaded them to erect something much more startling. His creation was the Atomium, a giant sculpture inspired by the structure of an iron crystal, its name a combination of Atom and Aluminium. Eight giant aluminium spheres mark the corners of a rotated cube, with a ninth at the centre, and twenty tubes join all the orbs together. The whole thing rises to 102 metres high, which is approximately two Nelson's Columns, if you're measuring in Imperial units. And I'm torn between whether the best thing about it is how it looks, or the fact that you can wander round inside. 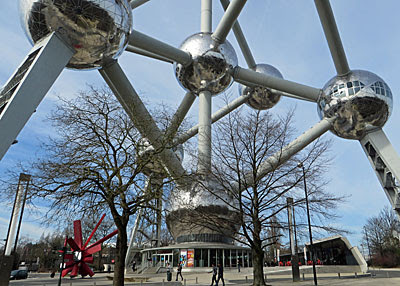 The Atomium stands in the northwest corner of Brussels, in a wooded park alongside the Heysel Stadium, aligned perfectly symmetrically at the centre of a grassy boulevard. Turn up on a sunny day and it gleams, thanks to the outer layers being replaced by stainless steel when the building was restored ten years ago. The addition of a visitor pavilion at ground level, and the creation of various exhibitions within, has helped to turn the hasbeen structure into a top attraction. So when in town, as I was on Wednesday, the Atomium was top of my list. A Tintin lookalike in a plastic head greets you on the way in, shakes you by the hand and then poses with you for an obligatory photo. That trial over, the first of your ascents begins. 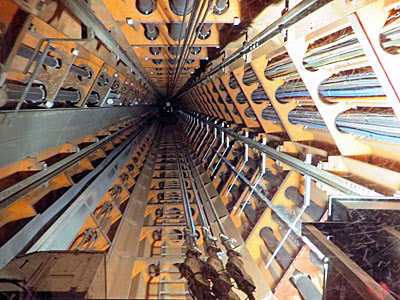 This is to the uppermost sphere, accessed via what was (in 1958) the fastest lift in Europe. A glass panel on the roof of the lift allows you to look up the shaft as you rise, which is either thrilling or unnerving. 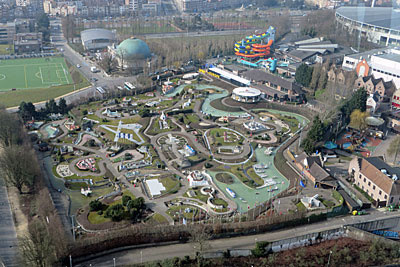 And then you step out onto an observation deck with a 360 degree view over Brussels and beyond... or more immediately the former exhibition ground below. The Palais des Expositions at the end of the boulevard was built for the Brussels International Exposition of 1935 and is remarkably imposing, and still used for exhibitions to this day. Probably the most interesting thing to stare down onto is a unique model village called Mini-Europe. It contains scale models of 350 European landmarks from over 30 countries, and has been up and running hereabouts since 1989. Notre Dame and the Acropolis were easy to identify, but I struggled to pick out the UK section because the largest exhibit turns out to be Bath's Royal Crescent, and that's not immediately obvious from above. Mini-Europe's precisely the kind of attraction I'd like to have explored later, but unfortunately it only reopens after its winter break on Saturday, hence the only people inside this week were those giving the turf and buildings a last-minute spruce-up. Dammit. Having peaked in the top sphere, the Atomium tour heads straight back down again in the lift so you can go up again. This time it's via escalator, first into the lower globe where an exhibition outlines the history of the structure. Everything about the design, the old documents and the associated Expo paraphernalia screams 1958, which I really liked, though some of the younger visitors a little less so. After a couple of floors it's time to ascend to the next ball, accessed via what was (in 1958) the longest escalator in Europe. Portholes along the way remind you you're inside a giant strut, almost unimaginable from the outside, but the only way to climb. 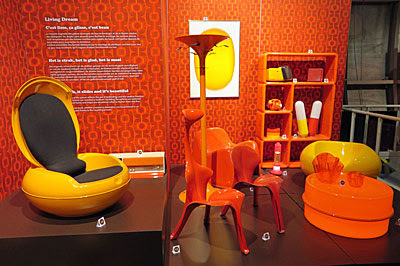 In sphere 4 they host temporary exhibitions, which at present means Orange Dreams, a retrospective of 60s and 70s interior design. Every exhibit is plastic and every exhibit is orange, which I liked even more, lifted from a local collection called the Plasticarium. A globeful of video I enjoyed rather less, and the next was accessible only to children - school parties get to sleep here overnight. When finally the tubes and staircases return you to the ground, you're faced by the photo (and associated keyring) snapped earlier, which is unceremoniously binned the minute you say you don't want it. And then it's out to gawp at what you've just been round, the entire structure suddenly making much more sense. If the Atomium was in London it'd be the talk of the city. Instead it's become the symbol of Brussels, even of Belgium, with its message of scientific hope beaming forth from the 1950s. A finer folly you'd have to look far to find.